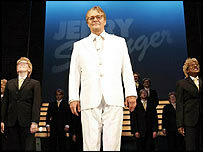 The BBC's director of television has denied that Jerry Springer - The Opera is blasphemous after it screened the show despite Christian group protests. Jana Bennett said: "I wouldn't accept that you could say this is blasphemous. There's a big debate about that." She told BBC Radio 4's Today programme that it was "a really good piece of opera that had something to say". The corporation received 47,000 complaints before it broadcast the hit musical on BBC Two on Saturday. Hundreds of protesters rallied outside BBC buildings on Saturday before and during the broadcast, which featured characters playing Jesus, Mary and God as guests on Springer's TV show and up to 300 swear words. 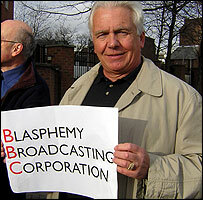 Prayer group Christian Voice said it would bring a private blasphemy prosecution against the BBC. A further 900 complaints were received after the broadcast, with 500 people calling or e-mailing in support. "We were certainly struck by the scale of the protest, and the e-mails as well as letters and phone calls, but obviously viewers and listeners have an absolute right to make their voices heard," Ms Bennett said. She said the BBC was "surprised by the scale of the campaign" and that staff had faced "threats" and "quite a lot of pressure in terms of direct action". "That was a new situation for many people and an unfortunate one but we lived our lives as normal," Ms Bennett said, denying reports that any member of staff had gone into hiding as a result. 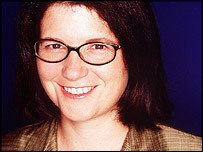 Ms Bennett said the BBC had "thought very hard" before deciding to broadcast Jerry Springer - The Opera, which she admitted was "controversial at times" but "done in an excellent way". "It was not a surprise that we considered bringing it to television given that it has won every theatrical award practically it could win as an opera," she said. Ms Bennett noted that the opera "hadn't given rise during its 550 stage performances to any protest or complaints from Christian groups". Asked whether the BBC would have broadcast a similar show if it had focused on Islamic beliefs rather than Christianity, Ms Bennett said she "could not answer" the question because such a play was "not one we're considering". "It's all about judgement," she said. "But I don't think you can rule out any subject matter. You have to take every piece on its merit." "We have to judge whether this is a piece of artistic merit, which may cause some offence," Ms Bennett said. "Does the merit outweigh this, and does it have something to say to make it a meaningful and worthwhile experience?" She added: "Do we have an obligation to bring to viewers the best of creative works even if they are controversial? Yes, we have a role in television and the BBC has that cultural role as well."